As users eagerly await tablets from companies like Apple and Microsoft, Fusion Garage jumped ahead with the demonstration of JooJoo, a handheld Internet and entertainment gadget with a 12.1-inch touch screen. Tablets are a new category of handheld devices with large screens for users to surf the Web and watch videos. JooJoo is due for release in a few months but could be held if a lawsuit is filed by TechCrunch, which originally partnered with Fusion Garage to develop the device under the name Crunchpad. Meanwhile, a number of other tablets that double as video players, e-book readers or even alarm clocks are already available for order. These devices have touch screens from 4 inches to 15 inches and can sit on tables or be carried in the hand. Some tablets from companies like Camangi, Archos and Innovative Converged Devices include Google's Android OS and run on fast chips designed by Arm. 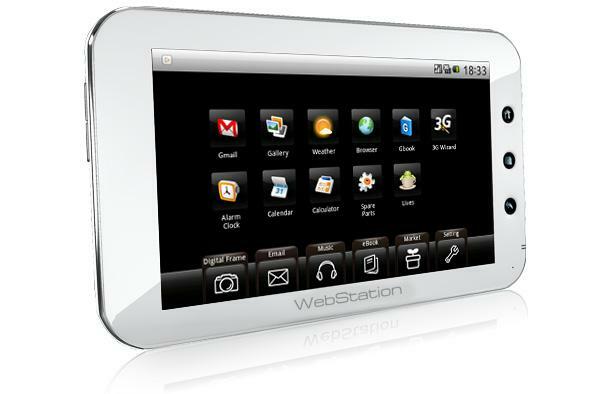 Camangi is now taking orders for its WebStation tablet, which is designed to mainly run Web applications. The device also functions as a digital picture frame, music player and e-book reader. A number of programs can be downloaded from the company's application store for users to run productivity software or indulge in casual gaming. Built on the Android OS, the tablet includes Wi-Fi 802.11 b/g connectivity for Internet access and has a browser from which users can access sites. It includes a 7-inch touch screen that can display images at a resolution of 800 pixels by 480 pixels. It weighs just 13.75 ounces (390 grams), so the device can be easily moved around. It measures 4.72 inches (120 millimeters) in height, 7.87 inches (200mm) in width and 0.57 inches (14.5 mm) in depth. The device includes a lithium-polymer battery that gives it a run time of up to five hours when using the Internet. The device also includes a MicroSD card slot for data storage, and it is powered by the Marvell PXA303 processor running at 624MHz. It is priced at US$399 and is available for preorder on Camangi's Web site. Archos is known for its personal multimedia players, but it is now focusing on bringing entertainment and communications capabilities to its next generation of portable devices. One such device is the versatile Archos 5 Internet Media Tablet, which is somewhat like a handheld Tivo. The gadget is not only capable of surfing the Web, but also of recording and playing back video or broadcast TV. The device has wireless connectivity for users to watch streaming video from Internet sites like Netflix on TV sets. The device has a 4.8-inch touch screen that can play back video in a 720p resolution. The device supports MPEG and WMV video files and a number of audio file formats. It comes with built-in Wi-Fi b/g to connect to the Internet. The tablet has an internal hard drive capacity of up to 250GB and comes with an optional DVR Station that aids in recording and transferring TV programs. The DVR Station includes the ports needed to bring TV programs to the device, including HDMI (high-definition multimedia interface), composite and S-video outputs. The tablet can act as a Wi-Fi receiver, allowing users to surf the Web on the TV. Running Google's Android OS, the Media Tablet includes a powerful Arm Cortex chip that is capable of running high-definition video. Applications that are downloadable from Archos' store add gaming capabilities to the device. The tablet is available for $250 on Archos' Web site. The company is also taking advance orders for a tablet device called the Archos 9 PCtablet, which is a handheld PC powered by Intel's Atom processor. It has an 8.9-inch screen and measures 0.67 inches at its thinnest point. It offers full PC functionality with an on-screen keyboard, and runs the Windows 7 OS. The device is available for preorder on the company's Web site. ICD has hyped up its Vega tablet PC, which is based on the Android OS. The company calls the device a "low-cost, large screen in-home device with complete connectivity." The device looks promising -- it has a 15.6-inch touch screen, which is larger than JooJoo's 12.1-inch screen -- and includes a webcam to make it a videoconferencing device. The company will launch the tablet in 7-inch, 11-inch and 15-inch touch screen versions worldwide in the first half of 2010. Depending on the tablet size, it could function as a handheld or stationary device. The Vega will be powered by the Tegra mobile processor made by Nvidia, which means it will be able to play back high-definition video, much like Microsoft's Zune HD, which is also built on Nvidia's Tegra CPU. It also includes a number of wireless connectivity options, including 3G mobile broadband connectivity, Wi-Fi b/g and Bluetooth connectivity. Pricing information was not immediately available, but with the low-cost tag, it better not be more than $300. The company declined to comment on pricing for the device. Sony has a rich history in developing entertainment devices, and the company's upcoming Xperia X10 smartphone could become one of the better mobile devices for multimedia and entertainment. The device has the hardware and software necessary to take high-resolution pictures, access Web sites and stream video from the Internet. It includes an 8.1-megapixel camera, and images will be displayed on its 4-inch OLED (organic light-emitting diode) touch screen. The device is powered by Qualcomm's Snapdragon processor running at 1GHz, which is also used in netbook-like devices running full-fledged Linux operating systems. The Xperia weighs just 135 grams. Besides the hardware, software will partly decide if the phone succeeds. The phone runs on the Android OS, and two pieces of software called TimeScape and MediaScape bring the entertainment and communication applications in one window, according to Sony. Users will be getting fast access to applications like Facebook and Twitter through a simple interface. But how will the device match up against Apple's iPhone? The Android Market -- its application store -- pales in comparison to Apple's App Store, which is partly responsible for iPhone's success. I've found it difficult to find relevant applications on my Android phone, but the Xperia X10 could encourage Android developers to write more applications. The company didn't comment about the device's battery life, which could also be key to its success. If the battery life is halfway decent, I will pick up the phone as soon as it is launched early next year. The price is not available yet, but I'm expecting to pay a hefty sum, plus the two-year mobile-phone contract that may come with it. Microsoft is also expected to release its own tablet, called Courier, though the company has refused to comment about it. The device is not a tablet, but a booklet, says Gizmodo, which broke news about the device. It can be folded and shut, much like a book, with each page serving a different function. For example, a user can take notes on one page and view maps on the other. Courier's design resembles OLPC's XO-2, a laptop with two touch-screen displays and touch-based input on both screens. The XO-2 is due out next year, according to OLPC.